The excitement never stops with this deluxe three in one rotating table game. When you have had enough of one game, simply rotate the table and it is on to a new one! 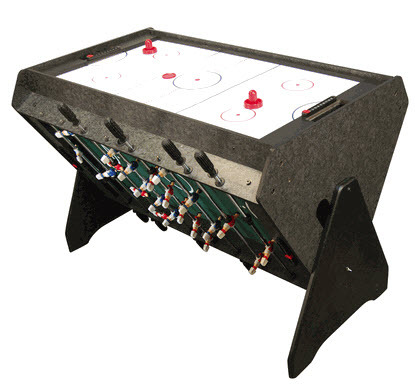 The game includes everyone's favorite air hockey and also comes with pool and the classic foosball. Non-stop thrills and a perfectly sized game will fit great in anyone's home, den, office, or game room. These will go fast so get them while we still have them! Turn your game room, bar or garage into the ultimate fun zone with the 3 in 1 Game Table by On the Edge. This triple-play game table will keep your family and guests entertained for hours. This innovative game table features foosball, air hockey and mini-pool games all in one space saving unit. Simply turn the table over for entertainment that takes up only a small space. Space-Saving design features an easy to rotate tabletop that locks into place. This 3-in-1 table provides for maximum recreation in limited spaces. Equipped with game accessories for all games, this table is great for football parties, barbeques and all other get togethers. Assembly required.